It used to be that chefs didn’t need to be on television. Now, many of them say, it’s important to be filmed for TV or the Internet, or both. “Not to participate is not smart,’’ says Jody Adams, chef and owner of Rialto in Cambridge. “To fill your restaurant, you have to be recognized one way or the other.’’ Adams is speaking after filming her 19th video for how2heroes.com, a Cambridge-based site. Last month, Joanne Chang was cooking again for Food Network, this time at her South End restaurant, Myers + Chang. 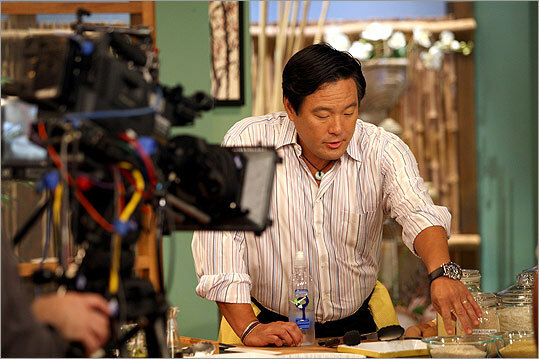 A week later, Ming Tsai was filming the ninth season of “Simply Ming’’ for PBS. All of these chefs consider videos and TV part of what they do. The better they come across on camera - and many take media training to understand how to do this - the bigger their reservation books swell. And if they have written cookbooks, those sales will swell, too, if the authors have a TV presence. Both Ming and Adams were on food competition shows recently that got them lots of attention. Viewers see a seamless flow of cooking mixed with repartee, personal stories, and kitchen hints. They do not see flubs, informal dialogue rehearsed over and over, or the crew of stylists backstage. As for the expense, Tsai’s costs are donated or underwritten by sponsors. Chang and Adams supply their own ingredients and staff. Cooking shows debuted in Boston with Julia Child’s 1963 “The French Chef.’’ Today, there are 109 programs listed on the Food Network website, with many of the same shows among the 88 programs aired on its sibling, Cooking Channel. PBS offers 50 cooking shows. Viewers can also find shows on Bravo, ABC, NBC, Fox, BBC America, and VH1. Tsai’s television studio is at Clark Distribution in Milford, behind displays of Sub-Zero appliances, Wolf ranges, and other high-end kitchen luxuries. The set, built by Clark and donated by the company for the show, has an Asian sensibility with a Buddha statue, shoji screens, and Chinese prints. Even though he has had media training, Tsai has to repeat these simple sentences so many times, he exclaims, “Mon Dieu!’’ to laughter from an audience of 30. A crew of seven manages the cameras, cranes, lights, and a floor of cables. Cooks rush finished dishes off the set to be photographed for Tsai’s website. Engineers in a windowless room monitor the taping and speak to Tsai through a microphone. Behind one shoji screen, two chef instructors and five interns from Johnson & Wales University’s culinary school prep ingredients. In this show, which centers on the technique, pane a l’Anglaise, Tsai is explaining how to flour, egg, and crumb meat or fish, then saute it. He likes to use panko but offers options, including corn flakes, macadamia nuts, and cornmeal. He crams a lot of information into the segment. Then Pepin joins him and together they unveil a covered dish to find what protein they are using (the secret ingredient, similar to “Iron Chef’’). Tsai calls this season’s shows “Simply Ming: On the Fly,’’ in which he cooks without recipes. Today they have turkey breast and butterfish. Tsai coats the fish in panko, Pepin coats boneless turkey with fresh bread crumbs and Parmesan. The French chef consumes the fish with gusto. There’s a lot of tasting and swooning that goes on in TV cooking shows. After sips of Cote du Rhone and champagne, the taping is over. Chang, who has not had nearly Tsai’s experience on air, admires his ability to balance television while running his Wellesley restaurant, Blue Ginger. Chang, the owner of three Flour Bakery + Cafe locations, sought his advice about a TV series after she made successful appearances on Food Network and NBC’s “Today Show,’’ among others. On a Friday afternoon recently, Goldman is filming with her for his upcoming Food Network series, “Sugar High.’’ A crew of six sets up in the kitchen of Myers + Chang, which she owns with her husband, Christopher Myers, and does not leave until dinner is well underway. At her Cambridge restaurant, Adams, another relative newcomer to cooking shows, is filming for the local video site how2heroes.com. Only food deliveries and the drone of the wine cooler interrupt the quiet. Extraneous sounds will be edited out later at the video company’s offices in Inman Square. The site was founded in 2007 by Taunton native Lynne Viera, who now has a staff of 16. How2heroes celebrates professional chefs and home cooks. In the easygoing atmosphere, Adams applies lipstick, pats her hair, and filming begins. She makes grilled lobster and corn salad, prepping lemon and orange vinaigrette in a prep area in the dining room. Her salad is a pretty melange of herbs, Bibb lettuce, corn kernels, cherry tomatoes, avocado slices, and lobster pieces still in their shell. It is arranged by Adams, then whisked away for photographs (these appear on the website). “The hardest part of a shoot is not eating the food before [we] take photos,’’ Viera says. Except for delays - a dead camera battery, minor noise problems - the morning goes smoothly. The crew is gone in an hour and a half. There’s more work later in the editing process, which is the case for all shows. For these three, that still means a full dining room. Peggy Hernandez can be reached at mphernan1@gmail.com.